A morose political drama and romance, Night Train To Lisbon packs in plenty of plot but remains more ponderous than provocative. 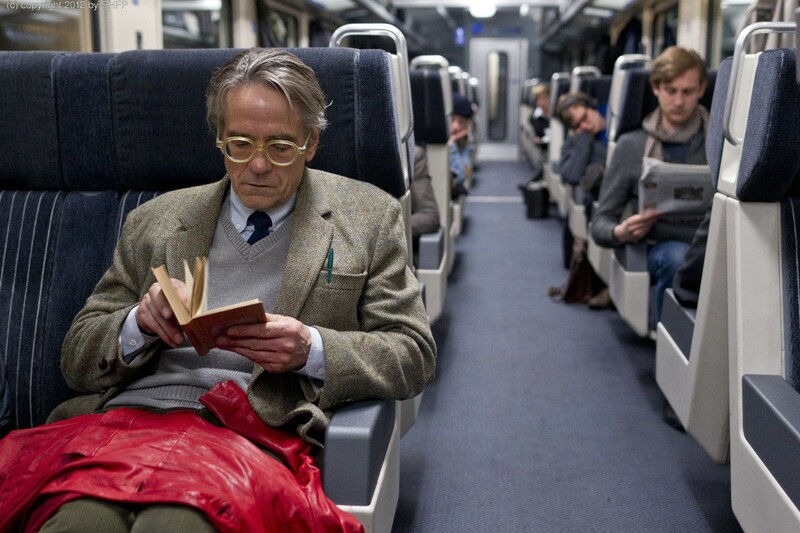 In Berne, grey professor Raimund (Jeremy Irons) rescues a woman before she can jump off a bridge. She promptly flees, and in her coat pocket Raimund finds a book and a train ticket to Lisbon. Impulsively he hops onto the train, and en route reads the book, which turns out to be a memoir by Amadeu (Jack Huston), a young aristocratic Portuguese doctor. Raimund is deeply affected by the lyrical prose, and in Lisbon goes looking for the author. He visits Amadeu's sister Adriana (Charlotte Rampling), and learns that the doctor died in 1974. Through a fortuitous accident Raimund meets optometrist Mariana (Martina Gedeck), whose uncle João (Tom Courtenay) knew Amadeu. Raimund also talks to Amadeu's teacher, the priest Father Bartolomeu (Christophe Lee). Slowly Raimund pieces together the history of a group of idealistic college graduates involved in the underground resistance against the Salazar dictatorship in the early 1970s. The group consisted of Amadeu, his best friend Jorge (August Diehl), João and the beautiful Estefânia (Mélanie Laurent). As Raimund learns about the struggles and loves of the young activists, he questions his own restrained life. An adaptation of the Pascal Mercier novel directed Bille August, Night Train To Lisbon has ambitions to be an intellectual and literary mystery. While the tone is earnest, the pacing thoughtful, and the content rich, the film also leans towards excessive self-absorption. August succumbs early and often to narration consisting of excerpts from Amadeu's book that may or may not be profound, but are certainly out of place. And Raimund's entire search-for-identity quest is off target, his suddenly instinctive and persistent actions inconsistent with the character. The girl-on-the-bridge opening is a beguiling mystery, but the film takes far too long to circle back to the incident, and overall no one in Lisbon appears to hesitate before revealing long held personal secrets to the inquisitive stranger from Berne. And far too much time is spent with Raimund going back and forth between Adriana and Jorge, the plotline revealed through intentionally interrupted drips that may work on the written page but not in a 110 minute screen treatment. The flashback scenes, where the film spends a good half of its running time, come with their own problems. The acting talent is generally about two levels down from the likes of Jeremy Irons, Charlotte Rampling and Christopher Lee, and the young activists appear to exist out of context. August spends next to no time establishing the framework of the Salazar regime, and tries to fit a full plot about young anti-government agitators, complete with a love triangle, into half of a movie's length. Unexpectedly it all comes across as half-baked and borderline amateurish. Night Train To Lisbon has good intentions to recount a worthwhile story, but is thwarted by clumsy execution.